In Super Mario Bros. for the NES and Famicom there exists a secret world, accessible by clipping through a wall to the first warp zone and entering the left-most pipe. This pipe will take you to level " -1". In the NES release, this level is extremely similar to 7-2, except the pipe at the end will send you back to the beginning of the level. There is no way to escape. Why does the Minus World exist, and why are all the level numbers negative? Someone voted to close this question and it ended up in the CV queue. While I understand why this question was asked on Retrocomputing, you might want to elaborate a little bit on the glitch in a Retrocomputing context so others decide not to vote to close your canonical Q&A pair. In Super Mario Bros, you can access warp zones in three areas of the game. There are two of these that are important for the minus world glitch: the one at the end of World 1-2 (following the exit pipe) and the one at the end of World 4-2 (also following the exit pipe). 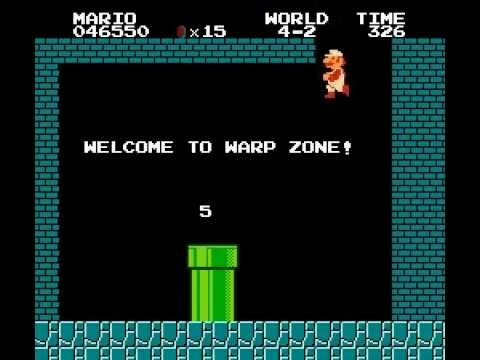 The first warp zone takes you normally to World 2, 3, and 4, while the second one only allows the player to World 5, however, the warp zones internally must have three locations. This was done, because the 36 (0x24)'s tile is a tile that takes the color of the current background (for all intents and purposes, transparent). The first nine represent the numerals 0 through 9, and the next 26 being capital letters (A-Z). For unknown reasons, the World 4-2 warp zone is the "default" warp zone, and it's warp zone data is used if there is no other data loaded. Normally the game loads the data from the first warp zone when you walk to the end (scrolling the screen), but performing the wall glitch moves the character without scrolling the screen. There is a scroll stop tile which moving into the warp zone area activates, which refreshes the current warp zone data. Because when you perform the wall glitch, it moves the character without scrolling the screen, you never scroll far enough to activate the scroll stop which refreshes the warp zone data. Because of this, the default is then used, and because the pipe exists, you are free to swim in the never-ending ocean that is World 36-1. But aren't there only 8 worlds? There are eight intentionally developed worlds, with four levels each. However, the game doesn't stop at World 8. In fact, theoretically there are a total of 256 valid worlds (0-255). A byte stores both the world counter and level counter. When a level is loaded, it loads an area from an address. For worlds 0 and 9-255, it loads other data as the room offset. A Japanese fan site has documented all of the worlds and levels and even describes the mechanism on how Super Mario Bros. loads the levels (and why the worlds work they do). Worlds 2-2 and 7-2 are duplicates of each other, and it also happens to be World 36-1 in the NES version. Because no pipe data in ever loaded (it is loaded when 2-2 and 7-2 load I believe) it uses the default start position for the pipe which is the beginning of the level. Yes. In Season 3 Episode 35 of Pop Fiction, the team behind the internet show covered more of these "lost levels", sourcing Legends of Localization. They found that using cartridge hot swapping (and a form of memory corruption), one is able to access all 256 worlds. Most are unplayable and load garbage data, sometimes from RAM, but some are levels from the actual game, either with the correct tileset or not. Videos of all 256 worlds can be found here. The 256 levels could also be reached by using Game Genie when you figure out the pattern. (For example, they published codes for starting on worlds 2 through 8 here: http://www.gamegenie.com/cheats/gamegenie/nes/super_mario_bros.html). Warp zones exist at the end of some levels. In order to access them, you have to break through blocks at the top of the level, then run along the top until a secret area becomes visible. In order to access the warp zone below you, you have to fall through a gap at the right-most side of the level. The loading of the right-most wall is what triggers the message to appear and the pipes to initialise. 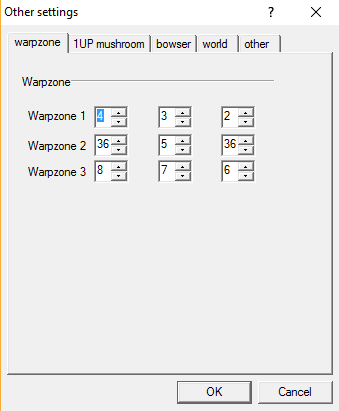 Before they initialise, they contain the data for the 4-2 standard warp zone, which has only one pipe (to level 5-1). The other pipes' warp data is filled in with the blank (air) tile, internally numbered with 36. The initial "uninitialised" state of the pipes is not a problem; whenever you access the warp zone you have to walk far enough right to fall through the gap, and therefore load the right-most wall. That is, unless you clip through the wall. By doing this, you are preventing the pipe's warp location from changing from World 36 before you enter it. World 36 was never programmed into the game. As a result the game tries to interpret "garbage data" when trying to load the level. For some reason, the data in question is mostly sections of other levels, so the level is still somewhat playable. However, as you have already found out, it is impossible to complete the first level in the NES version, as the pipe at the end simply leads back to the start. The reason the level number is displayed as -1 at the top of the screen is due to the way tile data works. Tile 36 is the empty space, and so this is what the game draws instead of the world number, which is the reason for the appearance of "no world". This is not coincidence; the very reason that the world you are warped to is World 36 is because tile 36 is blank (see the second paragraph). This effect is what causes the Minus World to appear to be "negative". There isn't actually anything "minus" about it, but the absence of any visible world number makes the dash that separates the world number from the level number look like a negative sign. In the Famicom Disk System version of the game, due to differences, level -1 is different (a 1-3 where you swim) and, importantly, completable. Level -2 is identical to 7-3, and level -3 is an underground-coloured version of 4-4 with neither Bowser nor a maze, and is full of flying bloopers. After completing the third and final level of the Minus World, you are taken back to the title screen.